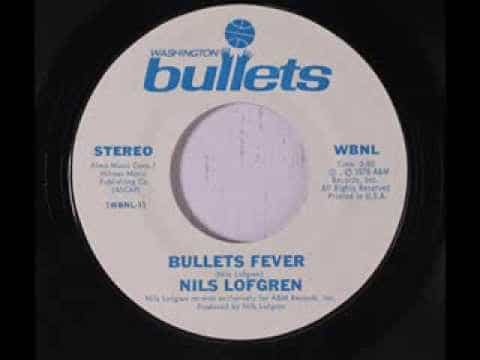 We talk a lot about soccer songs on Rockin’ the Suburbs (God knows why, exactly), but with the Washington Wizards locked in a playoff battle against the Boston Celtics, let’s take a moment to remember a lost gem about basketball. The year was 1978. A young Nils Lofgren (later of the E Street Band) was coming off playing guitar for Neil Young and leading his own band Grin. Watching TV in his suburban Maryland home, hoops fan Lofgren was inspired by the then-Washington Bullets (the name was changed in 1996 amid concerns about gun violence in D.C.) and their playoff run. Lofgren quickly recorded the song, playing all the instruments in the studio, and dropped off cassettes at D.C. radio stations. Soon the song was getting serious airplay across the local dial. As the Bullets continued to advance in the series, Lofgren updated the song with new lyrics. This culminated with the Bullets victory over the Seattle SuperSonics (yes, that was a team then, too) to win the franchise’s sole NBA title. Aside from its easy groove and hummable melody, “Bullets Fever” caught on for its many references, to “the Doctor,” “coach Motta” and “Mr. Hayes,” among many others. The song intrigued Bullets owner Abe Pollin, a prominent D.C. businessman, who called for a meeting with admitted hippie Lofgren. That led to a record deal of sorts. Pollin agreed to finance a run a 1,000 45s, with proceeds going to Pollin’s Leukemia charity. And what did Nils get for writing and recording this “hit song”? Season tickets to Bullets games for the next few years.